Earth Diggers Direct we are one of the best when it comes to quality and efficiency in earthmoving industry. We only use the finest and well maintained equipments for our work purpose to avoid technical defaults, which may occur during our maintenance process. If you are thinking of installing a post hole or you are thinking of trenching services our experts can be your one stop solution for every earthmoving services. We use the best equipments such as K9-4 Dingo Auger Drive +Augers 150mm,300mm,450mm,600mm and Endless chain Trencher for our trenching and post holes purposes. 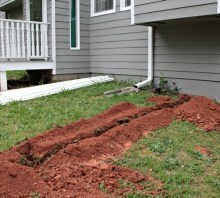 The best thing about our trenching machines are they are wide and are of perfect size. We can also drill post holes for fencing and many more, because according to us it is very important to have a neat , clean and evenly drilled post hole. With several years of experience we are well known for our excellent client services, our crew members are not only reliable they understand and value your time and money, calling us for the job will count down your money as well as your time.